Once the frames were in place, planking commenced from the keel up. The planks were one and three quarters of an inch thick and up to eight inches wide. There were 24 "strakes", each having a different shape. A total of about 4,000 3 1/2" screws held them in place. 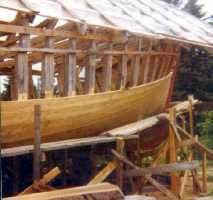 The forward ends of the first four planks were boiled in a tank made from 55 gallon drums. This was necessary because of the large amount of twist in the planks.